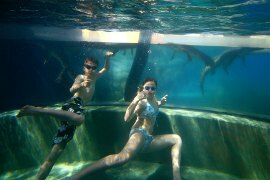 Crocodiles - timetable to swim with crocs, feed or just watch them, all in central Darwin at Crocosaurus Cove, 58 Mitchell St. These times and events were supplied by Crocosaurus Cove in August 2009. If you need to check their accuracy at todays date, please call Croc Cove. 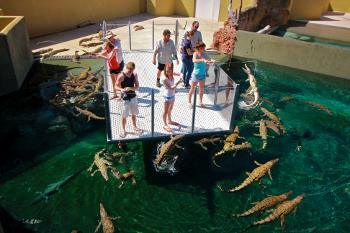 Bring your bathers for a cool dip right next door to the crocodiles. Return from Swim with Crocodiles to Enjoy Darwin Home.